การสะกดจิตส่งผลในการลดความเจ็บปวดจากมะเร็งและจากการรับมือกับมะเร็ง และโรคเรื้อรังอื่น ๆ การสะกดจิตยังอาจช่วยควบคุมอาการคลื่นไส้และอาการอื่นซึ่งเกี่ยวข้องกับโรคที่ไม่สามารถรักษาให้หายขาดได้ บางคนอ้างว่าการสะกดจิตอาจช่วยทำให้ระบบภูมิคุ้มกันของผู้ป่วยโรคมะเร็งแข็งแรงขึ้น American Cancer Society กล่าวว่า "หลักฐานทางวิทยาศาสตร์ที่มีตอนนี้ไม่สนับสนุนความคิดที่ว่าการสะกดจิตสามารถส่งผลกระทบต่อการพัฒนาหรือการรุกรามของมะเร็ง"
การแสดงการสะกดจิตเป็นรูปแบบหนึ่งของการให้ความบันเทิง โดยมักแสดงให้ผู้ชมดูในคลับหรือโรงละคร ผลของการแสดงจากนักสะกดจิตทำให้หลายคนเชื่อว่าการสะกดจิตเป็นการควบคุมจิตใจรูปแบบหนึ่ง การแสดงการสะกดจิตมักพยายามสะกดจิตผู้ชมทั้งหมด จากนั้นจึงเลือกคนที่อยู่ "ภายใต้" การสะกดจิตให้ขึ้นมาบนเวทีเพื่อแสดงสิ่งน่าอายต่าง ๆ ให้ผู้ชมที่เหลือดู อย่างไรก็ตาม ผลของการแสดงการสะกดจิตน่าจะประกอบจากปัจจัยทางจิตวิทยา, การคัดเลือกผู้เข้าร่วม, การชักจูง, การจัดฉาก และการใช้กลอุบาย ความต้องการที่จะเป็นศูนย์รวมความสนใจ, การมีข้ออ้างที่จะเอาชนะความกลัวของตน และความกดดันที่ต้องทำให้คนอื่นพอใจ อาจเป็นเหตุที่ทำให้ผู้ร่วมแสดง "ตามน้ำ"
↑ Encyclopædia Britannica, 2004: "a special psychological state with certain physiological attributes, resembling sleep only superficially and marked by a functioning of the individual at a level of awareness other than the ordinary conscious state". ↑ Erika Fromm; Ronald E. Shor (2009). Hypnosis: Developments in Research and New Perspectives. Rutgers. ISBN 978-0-202-36262-5. สืบค้นเมื่อ 27 September 2014. ↑ Steven J. Lynn; Judith W. Rhue (4 October 1991). Theories of hypnosis: current models and perspectives. Guilford Press. ISBN 978-0-89862-343-7. สืบค้นเมื่อ 30 October 2011. ↑ hypnos, hypnoō. Liddell, Henry George; Scott, Robert; A Greek–English Lexicon at Perseus Project. ↑ Harper, Douglas. "hypnosis". Online Etymology Dictionary. ↑ "hypnosis." Encyclopædia Britannica web edition. Retrieved: 20 March 2016. ↑ Hypnosis, American Society of Clinical. "Account Login". www.asch.net. ↑ Chapman, Robin (August 2005). Clinical Use of Hypnosis in Cognitive Behavior Therapy : A Practitioner's Casebook. Springer Publisher Company. p. 6. ↑ Fogel, S.; Hoffer, A. (1962). "The use of hypnosis to interrupt and to reproduce an LSD-25 experience". Journal of Clinical and Experimental Psychopathology. 23: 11–16. 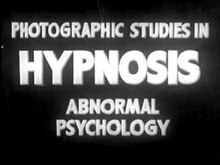 ↑ "Using Hypnosis to Encourage Mystical Experience" Archived 29 January 2010 at the Wayback Machine.. Counselinginoregon.com. Retrieved on 2011-10-01. ↑ Wier, Dennis R (1996). Trance: from magic to technology. Ann Arbor, Michigan: TransMedia. ISBN 1-888428-38-4. ↑ "Hypnosis." Archived 30 October 2013 at the Wayback Machine. ↑ "Australian Society of Clinical Hypnotherapists". ↑ 27.0 27.1 Deirdre Barrett (1998-07-21). The Pregnant Man: Tales from a Hypnotherapist’s Couch (1998/hardback, 1999 paper ed.). NY: Times Books/Random House. ISBN 0-8129-2905-5. ↑ Assen Alladin (15 May 2008). Cognitive hypnotherapy: an integrated approach to the treatment of emotional disorders. J. Wiley. ISBN 978-0-470-03251-0. สืบค้นเมื่อ 30 October 2011. ↑ Dorfman, David; George, Mary Catherine; Schnur, Julie; Simpson, David M; Davidson, George; Montgomery, Guy (July 2013). "Hypnosis for treatment of HIV neuropathic pain: A preliminary report". Pain Medicine. 14 (7): 390–401. doi:10.1080/00029157.2015.1011472. PMID 25928778. ↑ Robertson, D (2012). The Practice of Cognitive-Behavioural Hypnotherapy: A Manual for Evidence-Based Clinical Hypnosis. London: Karnac. ISBN 978-1-85575-530-7. ↑ "Hypnotist eliminates fears and phobias" comedywood.com. None. Retrieved on 2011-10-01. Archived 12 May 2013 at the Wayback Machine. ↑ Gow, M. A. (2006). "Hypnosis with a blind 55-year-old female with dental phobia requiring periodontal treatment and extraction". Contemporary Hypnosis. 23 (2): 92–100. doi:10.1002/ch.313. ↑ Nicholson, J. "Hypnotherapy – Case History – Phobia". London College of Clinical Hypnosis. ↑ Wijesnghe, B. (1974). "A vomiting phobia overcome by one session of flooding with hypnosis" (PDF). Journal of behavioural therapy and experimental psychiatry. 5 (2): 169–170. doi:10.1016/0005-7916(74)90107-4. ↑ Epstein, S. J.; Epstein, Seymour J. (1977). "Short-term Hypnotherapy for the treatment of flight phobia: A case report". American Journal of Clinical Hypnosis. 19 (4): 251–254. doi:10.1080/00029157.1977.10403885. PMID 879063. ↑ Rogers, Janet (May 2008). 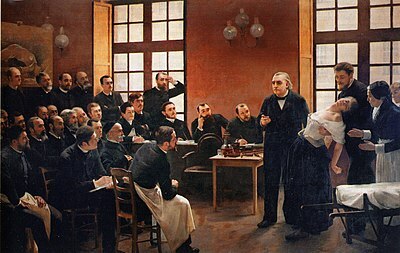 "Hypnosis in the treatment of social phobia". Australian Journal of Clinical & Experimental Hypnosis. 36 (1): 64–68. ↑ Kraft, T.; Kraft, D. (2005). "Covert sensitization revisited: Six case studies" (PDF). Contemporary Hypnosis. 22 (4): 202–209. doi:10.1002/ch.10. Archived from the original (PDF) on 19 January 2012. ↑ Elkins, G. R.; Rajab, M. H. (2004). "Clinical hypnosis for smoking cessation: Preliminary results of a three-session intervention". The International Journal of Clinical and Experimental Hypnosis. 52 (1): 73–81. doi:10.1076/iceh.52.1.73.23921. PMID 14768970. ↑ "Hypnosis. Another way to manage pain, kick bad habits". mayoclinic.com. Archived from the original on 4 December 2009. ↑ Anbar, R.D. (January 2009). "Childhood habit cough treated with consultation by telephone: A case report". Cough. 5 (2): 1–3. CiteSeerX 10.1.1.358.6608. doi:10.1186/1745-9974-5-2. ↑ McNeilly, R. (September 1994). "Solution oriented hypnosis. An effective approach in medical practice". Australian Family Physician. 23 (9): 1744–6. PMID 7980173. ↑ Dahlgren, L.A.; Kurtz, R.M. ; Strube, M. J.; Malone, M. D. (August 1995). "Differential effects of hypnotic suggestion on multiple dimensions of pain". Journal of Pain and Symptom Management. 10 (6): 464–470. doi:10.1016/0885-3924(95)00055-4. PMID 7561229. ↑ Patterson, David R.; Ptacek, J. T. (February 1997). "Baseline pain as a moderator of hypnotic analgesia for burn injury treatment". Journal of Consulting and Clinical Psychology. 65 (1): 60–67. doi:10.1037/0022-006X.65.1.60. PMID 9103735. ↑ American Psychological Association (2 July 2004). 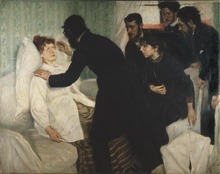 "Hypnosis for the Relief and Control of Pain". American Psychological Association. ↑ Vickers, Andrew; Zollman, Catherine (1999). "Clinical review. ABC of complementary medicine. Hypnosis and relaxation therapies". British Medical Journal. 319 (7221): 1346–1349. doi:10.1136/bmj.319.7221.1346. PMC 1117083. PMID 10567143. ↑ Pates, J.; Palmi, J. (2002). "The effects of hypnosis on flow-states and performance" (PDF). Journal of Excellence. 6: 48–61. ↑ Kirsch, Irving (1996). "Hypnotic enhancement of cognitive-behavioral weight loss treatments—another meta-reanalysis". Journal of Consulting and Clinical Psychology. 64 (3): 517–9. doi:10.1037/0022-006X.64.3.517. PMID 8698945. ↑ Bolocofsky, D. N.; Spinler, D.; Coulthard-Morris, L. (1985). "Effectiveness of hypnosis as an adjunct to behavioral weight management" (PDF). Journal of Clinical Psychology. 41 (1): 35–41. doi:10.1002/1097-4679(198501)41:1<35::AID-JCLP2270410107>3.0.CO;2-Z. PMID 3973038. Archived from the original (PDF) on 8 December 2013. ↑ Cochrane, G.; Friesen, J. (1986). "Hypnotherapy in weight loss treatment" (PDF). Journal of Consulting and Clinical Psychology. 54 (4): 489–492. doi:10.1037/0022-006X.54.4.489. PMID 3745601. Archived from the original (PDF) on 8 December 2013. ↑ Gonsalkorale, W. M.; Whorwell, Peter J. (2005). "Hypnotherapy in the treatment of irritable bowel syndrome" (PDF). European Journal of Gastroenterology & Hepatology. 17: 15–20. doi:10.1097/00042737-200501000-00004. ↑ NICE Guidance for IBS. (PDF) . Retrieved on 2011-10-01. Archived 8 October 2012 at the Wayback Machine. ↑ John F. Kihlstrom, University of California, Berkeley and Institute for the Study of Healthcare Organizations &Transactions Hypnosis in Surgery: Efficacy, Specificity, and Utility. Institute-shot.com Archived 19 December 2008 at the Wayback Machine. ↑ Patterson, David R.; Questad, Kent A.; De Lateur, Barbara J. (1989). "Hypnotherapy as an adjunct to narcotic analgesia for the treatment of pain for burn debridement". American Journal of Clinical Hypnosis. 31 (3): 156–163. doi:10.1080/00029157.1989.10402884. PMID 2563925. ↑ Mendoza, M. E.; Capafons, A. (2009). "Efficacy of clinical hypnosis: A summary of its empirical evidence" (PDF). Papeles del Psicólogo. 30 (2): 98–116. Archived from the original (PDF) on 8 January 2013. ↑ Ewin, D.M. (2001). "The use of hypnosis in the treatment of burn patients" (PDF). International Handbook of Clinical Hypnosis: 274–283. ↑ Butler, B. (1954). "The use of hypnosis in the care of the cancer patient" (PDF). Cancer. 7 (1): 1–14. doi:10.1002/1097-0142(195401)7:1<1::AID-CNCR2820070103>3.0.CO;2-0. PMID 13126897. ↑ Peynovska, R.; Fisher, J.; Oliver, D.; Matthew, V. M. (2003). "Efficacy of hypnotherapy as a supplement therapy in cancer intervention" (PDF). Paper presented at the Annual Meeting of The Royal College of Psychiatrists, 30 June – 3 July 2003. ↑ Spiegel, D.; Moore, R. (1997). "Imagery and hypnosis in the treatment of cancer patients". Oncology. 11 (8): 1179–1195. ↑ Garrow, D.; Egede, L. E. (2006). "National patterns and correlates of complementary and alternative medicine use in adults with diabetes". Journal of Alternative and Complementary Medicine. 12 (9): 895–902. doi:10.1089/acm.2006.12.895. ↑ Mascot, C. (2004). "Hypnotherapy: A complementary therapy with broad applications". Diabetes Self Management. 21 (5): 15–18. PMID 15586907. ↑ Kwekkeboom, K.L. ; Gretarsdottir, E. (2006). "Systematic review of relaxation interventions for pain". Journal of Nursing Scholarship. 38 (3): 269–277. doi:10.1111/j.1547-5069.2006.00113.x. PMID 17044345. ↑ "Hypnosis". American Cancer Society. November 2008. สืบค้นเมื่อ 22 September 2013. ↑ Jerjes; และคณะ (2007). "Psychological intervention in acute dental pain: Review". British Dental Journal. 202. ↑ Meyerson, J.; Uziel, N. "Application of hypno-dissociative strategies during dental treatment of patients with severe dental phobia". The International Journal of Clinical and Experimental Hypnosis. 63. ↑ Myers, David G. (2014). Psychology: Tenth Edition in Modules (10th ed.). Worth Publishers. pp. 112–13. ↑ Wagstaff, Graham F. (1981). Hypnosis, Compliance and Belief. New York: St. Martin's Press. ISBN 0-312-40157-4. ↑ Clarke-Billings, Lucy (2015-09-28). "Hypnotist jailed for ten years after sexually assaulting woman under his spell" (in อังกฤษ). ISSN 0307-1235. สืบค้นเมื่อ 2017-11-01. Braid, J. (1843). Neurypnology or The rationale of nervous sleep considered in relation with animal magnetism. London. : John Churchill. Blackwell, Willey (2015). The Handbook of Contemporary Clinical Hypnosis: Theory and Practice. ISBN 978-1-119-05727-7. Gibson, H.B. (1991). Hypnosis in Therapy. ISBN 978-0-86377-155-2. หน้านี้แก้ไขล่าสุดเมื่อวันที่ 22 มกราคม 2561 เวลา 20:57 น.